Welcome to our Ischia blog, Good Morning Ischia! Here you can see the entry for Sunday 19th January 2014. Today’s blog comes from the road as I tear myself away from Ischia for a couple of days. In fact it’s more accurate to say the blog comes “from the rail” as we head south from Naples to Calabria. Today’s weather is, as expected, very much on the gloomy side. As we passed Mount Vesuvius we could only really make out the volcano’s silhouette as it was shrouded in a thick mist. The route down mainly hugs the coast and as we look out to sea it’s as if somebody is covering the top two thirds of a picture, the grey sky neatly camouflaged behind the grey sea drawing the eye to the only visible moving objects as the waves crash against the breakers on the shore. The flotilla of small fishing boats stand defiantly in the face of the approaching mass of water, optimistically confident that they have been provided with sufficient coastal defence. Today’s photo comes from another of the spectacular new underground railway stations in Naples. I recently explained how the “Metropolitana” in Southern Italy’s largest city had undergone a dramatic transformation in recent years and some of its beautiful stations have won all kinds of architectural, artistic and design awards across the world. I previously shared a photo of Toledo station with its space-age escalators and funky shades of purple and blue caressing the walls as you make your ascent towards the city streets or descend into the subterranean wonderland to board your train. Another of these designer/boutique stations is “Universita’”, just one stop along from Toledo on line number one (“linea 1”), close to the city centre. The modern art in the above image is in the ticket hall and is just the beginning of a journey into the fantasy world below. At every corner of the station there’s something new, at times you feel like you’re in a cutting edge discotheque from the swinging sixties, at others you’re ready to take on Darth Vader and his storm-troopers on Star Wars’s Millenium Falcon. Universita’ and Toledo are just two examples of this incredible underground network that’s being put together and the work hasn’t stopped there with more stations in a similar vein planned for other stations across the city. 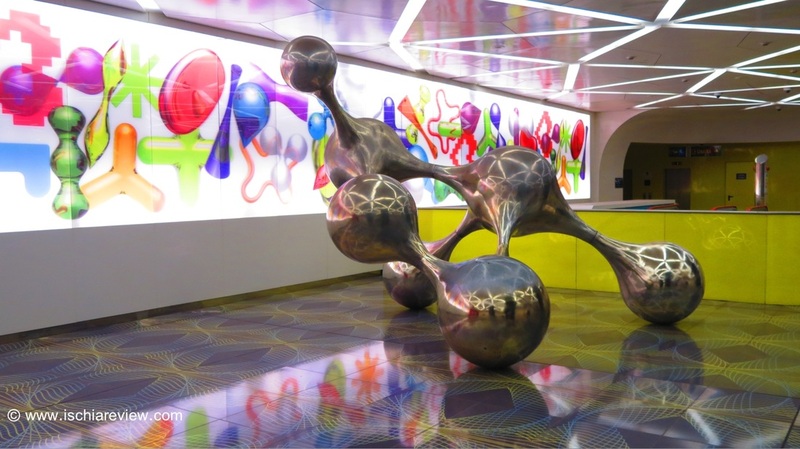 A new station has recently opened at Stazione Garibaldi, Naples’ biggest train station and most important transport hub. The new square in front of the station will be open soon and provide a welcoming new public space for rail visitors arriving in the city. Naples is one of the oldest and most historic cities in Italy and the modern underground system could be considered slightly incongruous to its ancient surroundings but when you consider that this world exists beneath the surface, it doesn’t detract from anything that already exists above the ground and just adds a fascinating attraction to what is an intriguing city, full of surprises and contradictions. Ok that’s all from me for today, I’ll be back with more tomorrow and again on the afternoon/evening shift as travel needs dictate. Please keep all your e-mails coming in, it’s great hearing from you all with your questions or stories about Ischia and we’re happy to do our bit if we can help in any way.